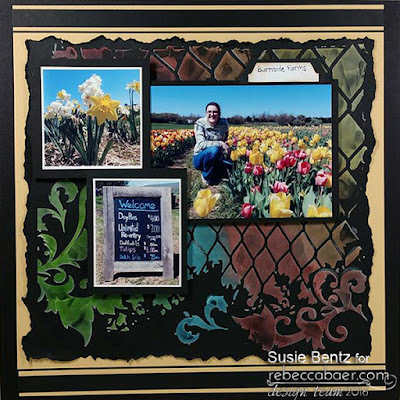 Living just outside Washington DC I was more than a little surprised to discover a tulip farm practically in my back yard! I absolutely love tulips (they were my wedding bouquet!) so I took my daughter to check it out and ended up with an impromptu photo shoot! I thought it was very appropriate to use Rebecca Baer Design's Urban Jungle stencil to create this layout and it really couldn't have been easier! First let me say that I love that Rebecca's stencils come in 3 different sizes! 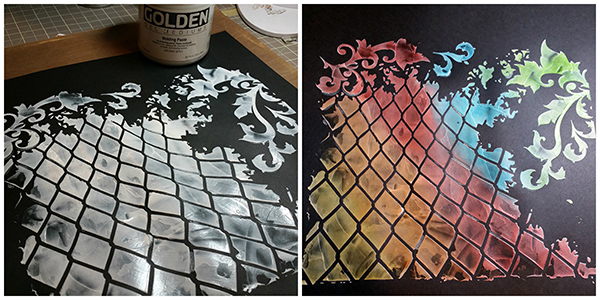 For this project I chose the large size and taped it over a piece of black cardstock and applied molding paste. After it dried I used a rainbow of inks to create wash of color across the page.